The Kubrick show, opening Nov. 1, covers his career from his early photographs for Look magazine to his film work, represented through annotated scripts, production photos, cameras, costumes and props. It also looks at two projects he never completed, Napoleon and The Aryan Papers. The travelling exhibit originated at the Deutsches Filmmuseum in Frankfurt, Germany. Kubrick and Spielberg worked together on ‘AI: Artificial Intelligence’. Kubrick died before the film started production, but wanted Spielberg to finish the project. I definitely want to go to this. 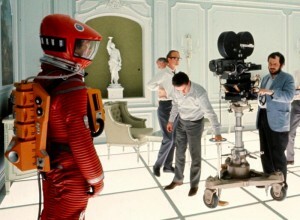 Movie props from Kubrick films? Yes please. I want a HAL-9000 unit. This is such a great idea. I want something like this in Dallas. This entry was posted on Tuesday, July 24th, 2012 at 10:56 am	and is filed under Events, Film, News. You can follow any responses to this entry through the RSS 2.0 feed. You can skip to the end and leave a response. Pinging is currently not allowed. « Take a Look at the Toronto International Film Festival Slate!!! Do you think our love, can take us away together? Good night. I'll be seeing you.